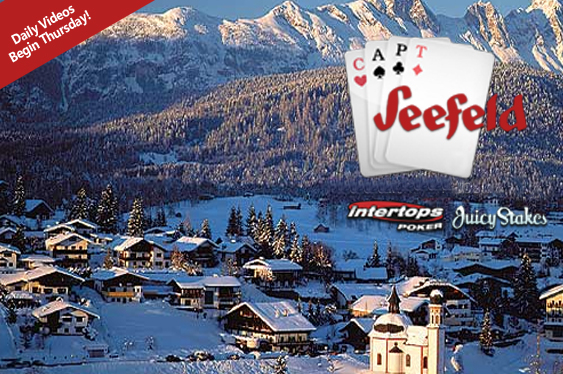 After launching a campaign that awarded prize packages to compete in the main event at the Seefeld stop of the Casinos Austria Poker Tour (CAPT), Juicy Stakes and Intertops Poker have revealed that their qualifiers are now beginning to arrive in Austria. One of the CAPT’s ‘big four’ competitions and featuring an estimated total prize pool of €800,000 ($867,980), the Seefeld stop will run until February 28 with its €2,160 ($2,343) buy-in main event due to get underway from February 26. Poker aficionados can follow the progress of the Intertops Poker and Juicy Stakes main event qualifiers via video reports set to be posted on the sites’ Living The Dream blog daily from Thursday. “I can't stop thinking about the tournament in Austria,” said Chris Perkins, one of the online qualifiers set to compete in Seefeld. Juicy Stakes and Intertops Poker are following online qualifiers via their Living The Dream blog. Juicy Stakes and Intertops Poker are also reminding online poker players that they are running a similar satellite tournament campaign offering competitors the chance to win one of five prize packages into the main event of the TK Poker Tour for as little as $1.10. The Horizon Poker Network sites declared that each of the packages are to be worth $3,000 and encompass the $1,100 main event buy-in alongside five nights’ accommodation at the Sonesta Maho Beach Resort in St Maarten including all meals and drinks, a $100 cash game voucher and $600 to help with travel expenses.